The Mogao Caves, near Dunhuang, form many Buddhist temples along the ancient Silk Road. They have a history that extends over 1,000 years and are now a UNESCO World Heritage Site. The 45,000 square metres of wall paintings in nearly 500 caves are an immense resource for the study of the history of art, architecture, religion, technology, politics and cultural exchange. However, the wall paintings of this historical site are vulnerable, and therefore any inspection needs to be non-invasive and non-contact. In addition, some of the caves have high ceilings that are not easily accessible, making it difficult to conduct scientific investigation. Scientific examination can help with answering artistic, historical and conservation questions about the caves. However, the wall paintings are vulnerable, and therefore any inspection should preferably be non-invasive and non-contact. In addition, some of the caves have high ceilings that are not easily accessible, making it difficult to conduct scientific investigation. Nottingham Trent University’s Imaging & Sensing for Archaeology, Art history & Conservation Lab is at the forefront of research in the development of advanced optical instruments for heritage applications. A project funded by the Engineering and Physical Science Research Council (EPSRC) led to the development of a portable remote multispectral and hyperspectral imaging system (PRISMS). 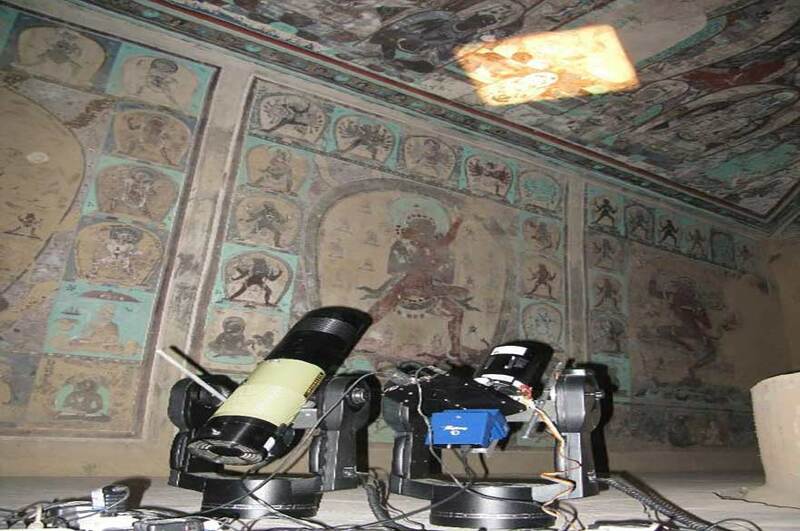 This lightweight and flexible device allows the high-resolution colour and spectral imaging of wall paintings, in both visible and near infrared light to be conducted from ground level. PRISMS is a self-contained, all-in-one 3D spectral imaging system that can determine distance automatically without relying on additional instruments. It provides the means of non-invasively monitoring the condition of paintings, revealing past interventions. This allows the study of painting techniques, including imaging underdrawings and revealing faded writings, as well as identifying pigments and the 3D surface structure of the paintings. PRISMS, the remote spectral imaging instrument developed for this study, has enabled the systematic survey of large portions of different caves (e.g. 100 square metres). Their condition can now be assessed, and the pigments used in the creation of the paintings can be studied. The project has revealed Sanskrit writings and changes in compositions that were not detectable by the naked eye. It has also contributed to our knowledge of one of the special caves where the dates of construction were in question. PRISMS has now attracted attention from industry, resulting in a number of industrial asset monitoring and management projects co-funded by innovate UK, NERC and industrial partners.